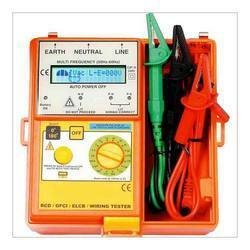 Can be used on 2 wires L-E (ELCB/RCCB/GFCI tester). Can be used on 3 wires L-E-N (with wiring check). Sense automatically 50 or 60 Hz. Current injected in phase with the voltage. 2 Lines × 16 Characters LCD. Zero Crossing Circuitry permit testing at 0° or 180°. Disconnection Phase Polarity shown on LCD display. Polarity Trip indicator (Positive of Negative Phase). Current settings: 3mA, 5mA, 7mA, 10mA, 15mA, 20mA, 30mA, 35mA, 50mA, 100mA, 125mA, 150mA, 175mA, 250mA, 300mA, 375mA, 500mA. 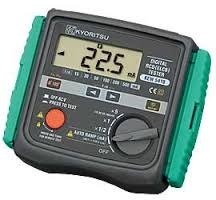 Conducting testing of rated residual non-operating currents at x 1/2 Range, measuring RCD trip time at x1 and x5 Ranges. Carrying out a constant measurement of voltagein the stand-by mode at each Range. 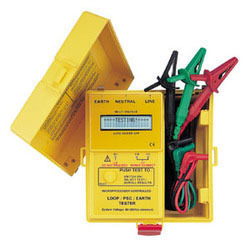 Detecting the voltage to earth of Earth electrodesor Protective conductors during RCD test – when applying test currents – at measurementusing EARTH in order to prevent electrical shocks caused by the damaged earth. Measurement will be ceased at AC50V or more. * Very Low Power Consumption. * Accurate digital readout of disconnection Time. * Automatic data hold function. * Zero Crossing Circuitry permit testing at 0° or 180°. * Disconnection Phase Polarity shown on L.C.D. Display. * Auto-Off and Off override. 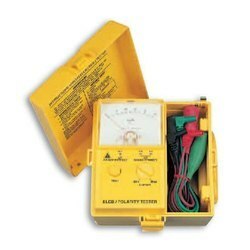 * Polarity Trip indicator (Positive or Negative Phase). Looking for ELCB Tester ?